This step to choose a restore point in the process presents the user with a calendar interface to help select the desired restore point. Days in which restore points were created are presented in bold. Select Date and hit next. The progress indicator completes and the computer is restarted with the new configuration. There is no cancel button to interrupt the process at this stage. If the computer loses power or is restarted, the restore will be reverted when Windows starts next – that is, the system will be set back to the state from just before the restore attempt was made. Note: The first step in the restoration is the creation of a new restore point. This enables you to undo the restoration if needed. If the system becomes nonbootable, and the last action taken was restoring an old restore point, boot using an Emergency Boot Disk (EBD) and System Restore provides the following message. System Restore detects that a restore was the last operation completed. It is recommended you now revert the changes to your system made by System Restore and restart before you proceed. If you choose not to revert these changes, this option will no longer be available. 1. Revert the Restore changes made to my system. 2. Do not revert the Restore changes made to my system. If you select the first option, System Restore reverts to the state prior to the restore operation and then prompts you to restart the computer. 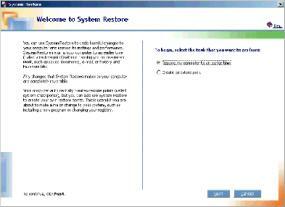 System Restore reverted the changes made by the last restore operation. Remove disks from the floppy disk drives and press CTRL+ALT+DELETE to restart your computer. Important If you select the second option, System Restore does not revert to the previous state, and this option is not available the next time the machine is booted from the EBD.